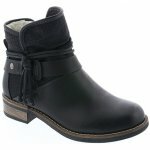 Rieker August 94689-00 women's ankle boots. These fleece lined boots feature a strap with imitation buckle and rope tassel. A lovely, casual ankle boot in black synthetic. Available from size 36 - 41 (UK 3 - 8).